CHANTABURI, July 26 – Khao Soi Dao wildlife sanctuary in Thailand’s eastern province of Chanthaburi has successfully bred the rare species, Great Argus, said Sornchai Sangkalert, head of this wildlife sanctuary. 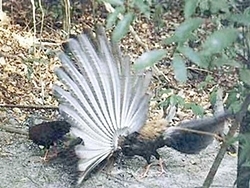 Known as the ‘Phoenix’ in some Asian areas, the Great Argus, or Argusianus argus is a type of pheasant with brown-plumage, a small blue head and neck, a rust-red upper breast, black hair-like feathers on the peak of its head and the back of its neck, with red legs. Now, Thailand’s newly-bred birds, two males and six females, are four years old and are in good health, Mr Somchai said. The Great Argus can reach as much as two metres in length when fully grown and is as considered by some beautiful as peacocks. It is an indigenous animal found in Thailand’s South and the Mayay peninsula. The species is rarely found in the wild as they have been hunted for trade and for eating. As an endangered species it fetches at least Bt50,000 ($1,666) each in illegal trade.